This post is sponsored by Mars. All opinions are mine alone. 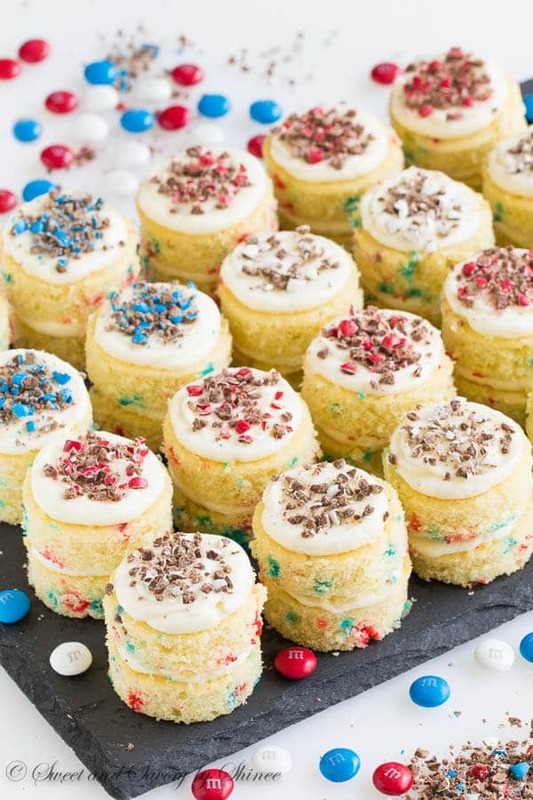 Bring festive mood to your summer celebration with these adorable funfetti mini layer cakes. 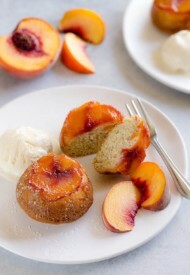 These fluffy little cakes are easy to make and a sure crowd-pleaser! Memorial Day is just around the corner. Can you believe it? Summer is so close, I can smell it. Waa-hoo!! I’m super pumped for this summer for couple of reasons. 1. It’s my first summer I get to enjoy it as a mom, watching my little baby learn to crawl. 2. I’ll be celebrating both Memorial day and 4th of July with the family here in the states. I’ve been out of country for the last couple of years, missing one or another. But this year I’m not going anywhere. Yay, bring on all the fireworks! All this just to say how excited I’m to plan and attend fun summer get-togethers with family and friends. And we’ve got to bring a cake! Since I adore mini desserts (I swear they taste better! ), I made us another batch of mini layer cakes! This time funfetti-style! Honestly, I haven’t been using cake boxes for a while. I have a special fondness to them though, because I made my 21st birthday cake out of a cake box. It was shortly after I first moved to the states and I wasn’t really familiar with all the baking ingredients. And as a college student, I needed something simple and reliable. Since having Grant, I found a new appreciation for cake mixes. So convenient and always delicious. By the way, do you know why cakes out of box always turn out just perfect? It’s because 1. you’re not messing around with measuring out flour. You see, incorrect amount of flour directly affects the texture of the cake, which is really easy to make that mistake if you’re scooping the flour by a cup. Too much flour = too dense, too dry cake. But with cake mixes, no such guessing. It’s simple! Just mix it with wet ingredients. 2. Pudding mix. Pudding mix takes any cake to another level! Speaking of wet ingredients, don’t follow the directions on the box. 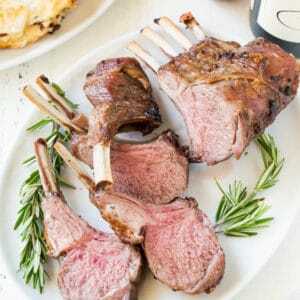 For richer flavor, use milk instead of water and melted butter instead of vegetable oil. The cake turns out extra rich and flavorful (thanks to extra fat). It’s amazing! 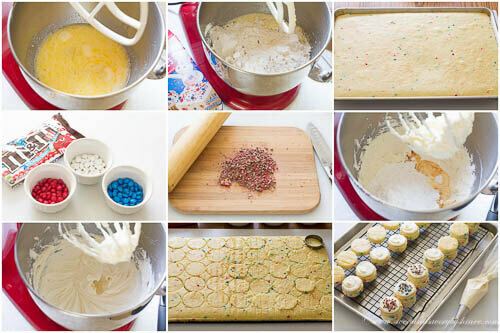 I absolutely love this Pillsbury funfetti cake mix, studded with festive candy bits that don’t bleed their color all over the batter. And it’s not all about pretty looks, this cake turns out perfectly fluffy and moist every time! Grab a box, or two, or three next time you stop by Target. Now, let’s talk about the whole presentation. Sure, you can whip up a regular sheet cake! But why wouldn’t you take an extra step to make the most adorable little cakes. As you know, I’m obsessed with mini layer cakes. I mean how could you not, right?? 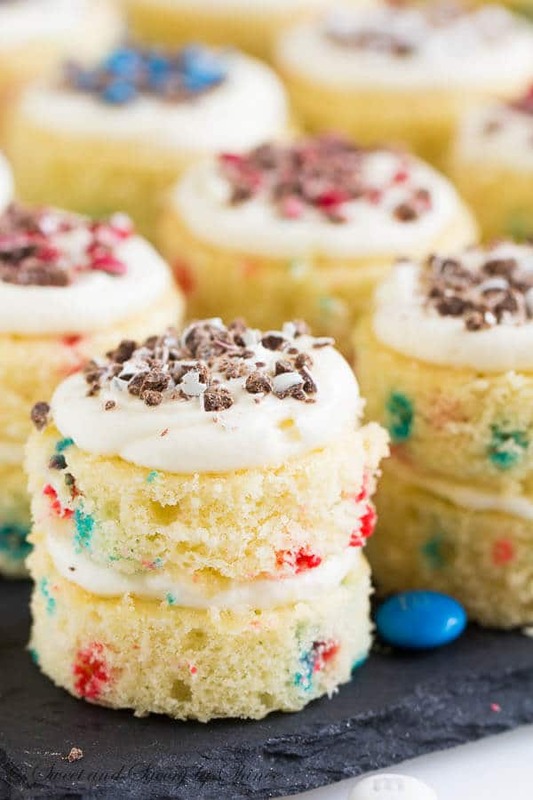 And to top it off, let’s crush some red, blue and white M&Ms and sprinkle them on the cakes. Because it’s more fun that way, yes? To make the cake, preheat the oven to 375°F (190°C). Line 17x11in (43x28cm) deep baking sheet with a parchment paper and spray cooking spray all over the parchment paper and on the sides. Alternatively, you can use silicone mat in place of parchment paper. In a mixing bowl with a paddle attachment, mix together eggs, milk and melted butter until well combined. Add cake mix and mix just until combined. Pour the batter into the prepared baking sheet and tap a few times to get rid of bubbles. Bake for 15-18 minutes, or until the inserted toothpick comes out clean. While the cake is cooling, make the frosting. Beat butter and cream cheese on medium high speed until fluffy for 1 minute. Add powdered sugar, heavy cream and vanilla extract. Beat on low speed for a minute. Then increase the speed to medium high and continue to beat until smooth and fluffy, about 3 minutes. Transfer into a piping bag. For decoration, sort the M&Ms by color (you’ll need about 2 tablespoons of each color) and crush them with a rolling pin until desired fineness. Set aside. To assemble, once the cake is cooled completely, cut out 2-inch circles using a round cookie, or biscuit cutter. You should get 40 circles. Place the cut out cake circles on wire rack. Pipe about heaping tablespoon of frosting on half of the cake circles. Using an offset spatula lightly spread the frosting. Then top with remaining plain cake circles. Frost the second layer the same way and finish with crushed M&Ms. 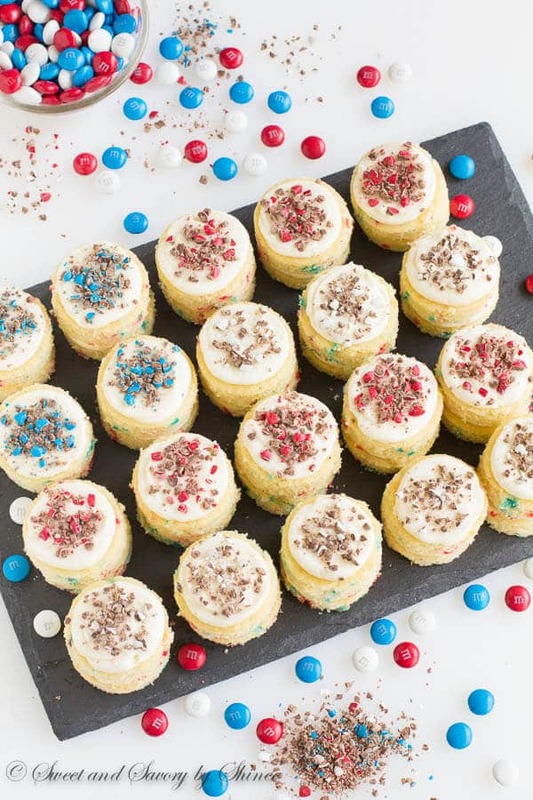 To arrange the cakes in flag pattern, you’ll need 4 blues, 8 reds and 8 whites. Store the cake in a fridge, covered, for up to 3 days. Make sure to use brick cream cheese, not the one in the tub. 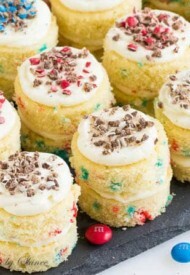 My son would practically go crazy over these mini layer cakes . Just exactly the way he likes it with M & M’s – Saving to make for him. Thanks for sharing!! These are so utterly adorable! My kids would LOVE these! These are such an adorable dessert…and you can’t go wrong with funfetti – always a hit!!! Right? Sprinkles are the best. Thanks for visiting, Sarah. Perfectly adorable! I would have no self-discipline around those adorable cakes. I’d embarrass myself and have a hard time explaining what happened to them all. They wouldn’t last five minutes around me. Nicely done! Haha Jackie, you and I are the same!! These cakes disappeared within 2 days, between me and my husband. 🙂 Thanks for stopping by! Aw, such cute little cakes! Who doesn’t love funfetti? Sprinkles make everything better! BTW that Julia Child quote is one of my favorites, and I think of it during a lot of meetings, lol. Agreed, sprinkles are the best! Thanks, Liz! What a cute idea. I love the mixes too. Amazingly moist and so much easier if you want to make a dessert quickly. I will have to remember your tip to use milk instead of water. Great idea. Looks fantastic! Thanks, Ali! Try milk next time, you’ll love it. Oh wow, these are SO pretty!! I love that they are mini, means there’s no guilt when you eat them, right?! These are adorable! I just made a regular sized funfetti cake from scratch and although it took hours – it was so much fun. Sprinkles just make everything fun don’t they? I haven’t used cake mixes in a while but I agree they are so handy in a pinch. Have an amazing summer! Thanks, Jolina! I bet your cake turned out amazing. Love sprinkles!